After Audi driver Rene Rast's double at the Nurburgring, one rival declared that the DTM "had moved the goalposts" and put Mercedes on the backfoot in its previously-dominant final year. All it took was a rewording of a paragraph in the DTM's regulations completed before Misano, but going largely unnoticed in the outlier that was that weekend's night racing and changeable conditions. 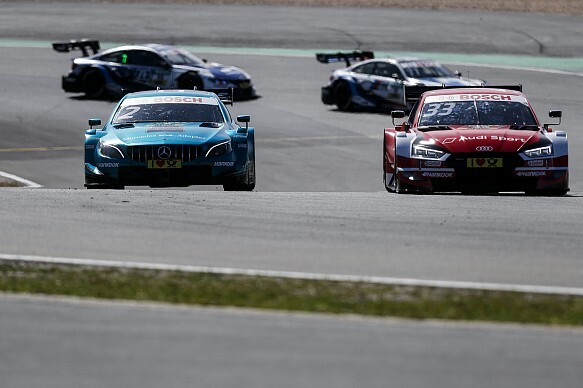 Firmed up thoroughly the day before the Nurburgring weekend, but crucially not a rule change, a minor tweak in tyre pressure rules became one of the biggest talking points in the DTM last weekend with Mercedes furious after the opening race. The DTM's updated Hankook tyres for 2017 were designed to create more variance in strategy, hoping to end the opening-lap pitstops or lengthy stints caused by a lack of tyre drop-off. But Hankook and the DTM then learned earlier this year that teams were circumventing the new compound's intention by running significantly lower tyre pressures and reacted by enforcing a minimum pressure of 1.3-bar, with most sources admitting that the limit was "quite high". Safety was key to the decision, but Mercedes has made a point of the fact that it has not had one tyre-related failure since 2017. The dispute had not reared its head in qualifying, and still Mercedes had the edge. It was only beaten by a virtuoso drive from Rast, who pipped Gary Paffett to pole. But the race was a totally different prospect as Paffett realised a Rast challenge was futile because he had no idea when and how he could push on the tyres without a huge drop-off, which happened late in his second stint and allowed BMW's Bruno Spengler to jump him for an easy second place. Suggestions of levelling the playing field went down badly with Mercedes, which can justifiably ask why such a change came so late in the day. 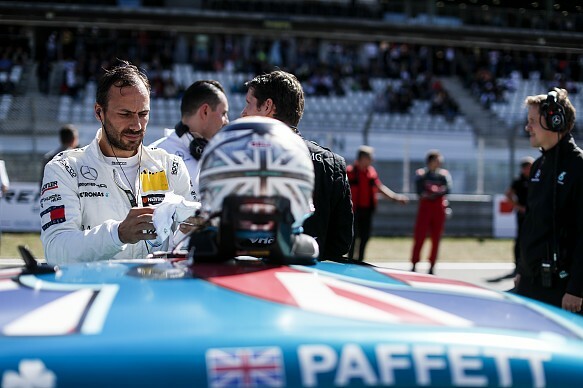 "It's not an attempt to level the playing field because clearly, it hasn't," Paffett said when Autosport asked for his thoughts on the DTM's reasoning. "It's an attempt to alter the results of the race, it's certainly not levelling. "Levelling the playing field is giving people the equipment and being able to take your car and design your set-up around the equipment and tyres you have. "Whatever tyre pressure you run is up to you, obviously there is a safety limit that Hankook enforce. But we are always above it anyway. This is far above what the safety limit is. "It changes the balance of the car, and also it changes how the pace goes during the race in the degradation in the tyres and things. "Qualifying pace from me and my team-mates was really good, so the car is the same pace [as it has been]. It's not the circuit, it's the same pace it's been every weekend, but the race pace, because of the tyres, is a lot worse." Following Paffett's comments and further ire from Mercedes, DTM boss Gerhard Berger released a statement that read: "This had become necessary as the tyre pressures partly were found to be considerably below the recommendations from the manufacturer in the pursuit of tyre performance. "The risk of punctures had increased considerably. Things simply had gone too far. "With the focus on safety, a compulsory minimum tyre pressure has been determined. Now, the tyres show exactly the characteristic that the ITR and the manufacturers had agreed upon when this tyre specification was introduced for the 2017 season." Hankook was given multiple opportunities to respond by Autosport, but chose not to. The DTM had, however, realised that it had impacted on sporting matters in a way it had wanted to avoid. With Sunday's early-morning practice was largely useless for relevant information - "When it's nine degrees outside you won't learn much," was Paul di Resta's take - the narrative continued into the second day of racing. Over a "late" Saturday night Mercedes found some answers to its problems, but it was too little too late to catch Rast on Sunday. Given the form the Audi driver was in, there may not have been a solution anyway. Paffett was prevented from battling Rast by a botched pitstop that dropped him from second to fifth and cost him 10 seconds, and he would finished around seven seconds behind Rast at the finish - which left Paffett in no doubt that he could have won. The change has not altered the competitive balance too dramatically, di Resta's clash with Phillip Eng meant a stunning recovery drive from 11th to second in the finale that still left him two points behind new points leader Paffett. What was certain is that BMW and Audi had little sympathy for its dominant competitor, with Audi motorsport boss Dieter Gass saying: "Rather than discussing the whys and ifs, I get on with it and try to maximise my package." 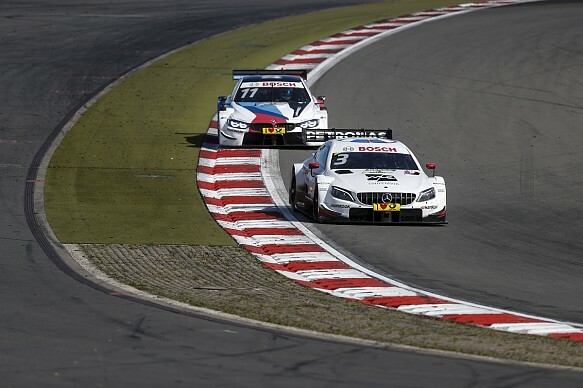 His BMW counterpart Jens Marquardt added it was "splitting hairs" and an avoidable problem: "Since we ran on Hankook tyres, they give a recommendation in terms of pressures, camber, load for a certain operating target." Several drivers felt this scenario was a one-off and would not reappear in the next round at the Red Bull Ring, but it does not change the fact the DTM found itself in an uneasy position. So much so one source compared it to a historical quirk of the German football league. The Bundesliga only recently, compared to the Premier League, mandated a common football, with it previously left up to the home teams to decide what would work best for them. In short, give a sportsperson a chance and they will find the unintended advantage and catch superiors unguarded.